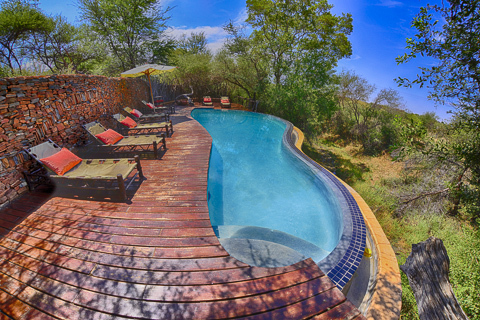 Ideally situated on 1800ha of private concession within the Malaria-free Madikwe Game Reserve. 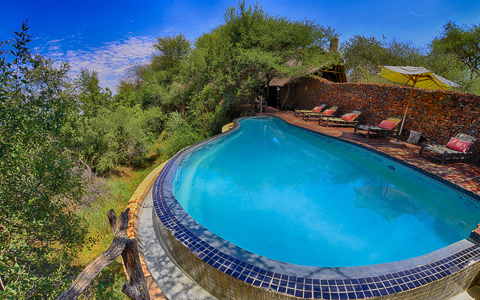 The closest exit gate from inside Madikwe is through Derdepoort Gate on the far north eastern side of Madikwe. Makanyane has its own gate just 5km down the road from the Derdepoort Gate. 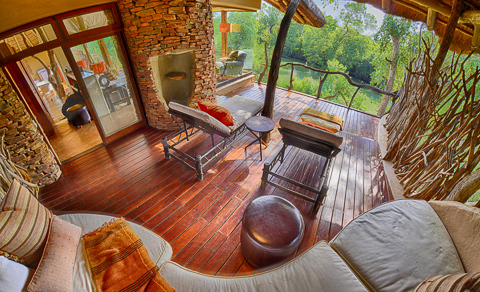 Makanyane Safari Lodge is beautifully designed to effortlessly blend with the surrounding bush and the wooden bridge from the parking area gives you access to the main lodge. We had a great welcome from Lynette and Maretha, who then introduced us to the rest of the Makanyane team; it was time for our nice cold welcome drink, then Maretha showed us round the lodge. As you enter you are transported into the large but cosy lounge area that has two stone fireplaces. The relaxed interior enhances the atmosphere of comfort in this idyllic environment, with the glass doors folding back to open out onto the wooden deck and another outdoor seating area that overlooks the Marico River. A staircase from the dining room leads to an upstairs conference room with TV and Video library. Wi-Fi is available throughout the main lodge. 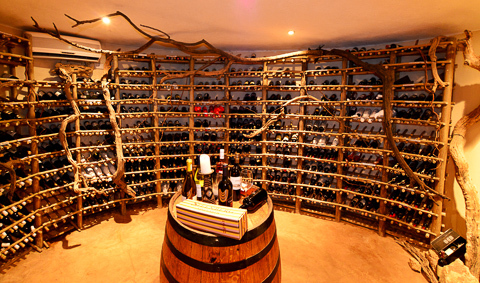 Another set of stairs leads down to their well-stocked wine cellar. From the wooden deck next to the outside bar is the lovely infinity swimming pool, which gives you a view of the riverine forest and river. This is where I saw an elephant that had popped down for a drink. Makanyane Safari lodge is unfenced and animals walk freely through the lodge grounds so guests need to be escorted to their rooms after dinner. Just before our boma dinner I needed to collect something from our room and on the way I pumped into a large elephant bull. I did not have my camera on me and by the time I wanted to go back and get it, it was too dark to take any decent pictures of the elephant without a tripod so I just observed him as he went about his business. The rustic bar is just off the lounge on the wooden deck overlooking the Marico River, this is where you can enjoy a pre-dinner drink and share your bush experiences. 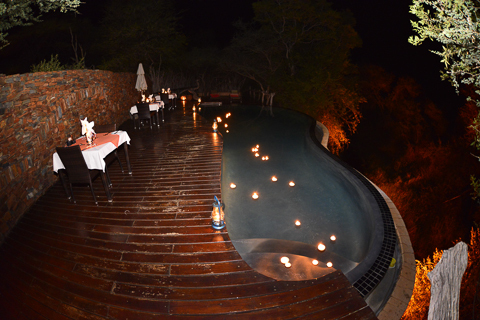 Dinners are served in a number of places; dining room, on the wooden deck, next to the swimming pool or in the boma. A gravel pathway behind the main lodge leads down to the boma which sits on the bank of Groot Marico River, a thatched lapa is where the food is served. 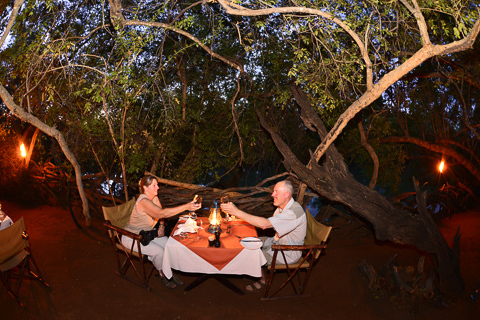 On our third and last night we had a very nice boma dinner under the canopy of trees. The food was delicious; we had roast beef, chicken, vegetable biryani (very hot) great salads, roast potatoes, vegetables and for desert we had the most delicious malva pudding and homemade ice cream. All our meals were really great - a mini breakfast is served just before the morning game drive and a full breakfast after the morning game drive. 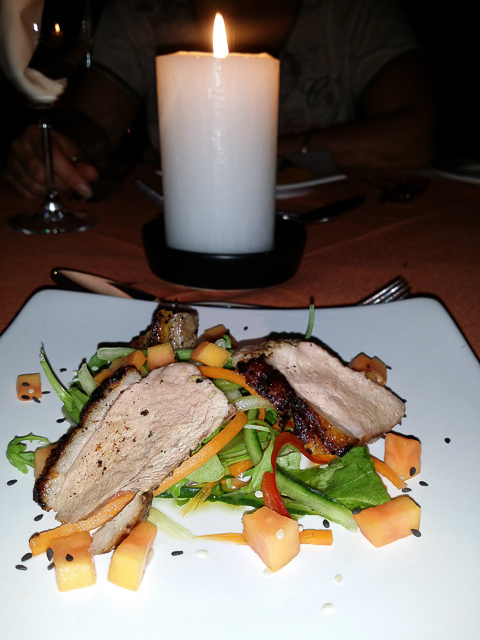 A light lunch is then served at 14h00 – we had chicken samosas, salad and a nectarine tart or Gemsbok kebabs, fish, salad, stuffed mushrooms. Afternoon tea is served just before the game drive goes out, so there is more than enough food to keep you going during the day! 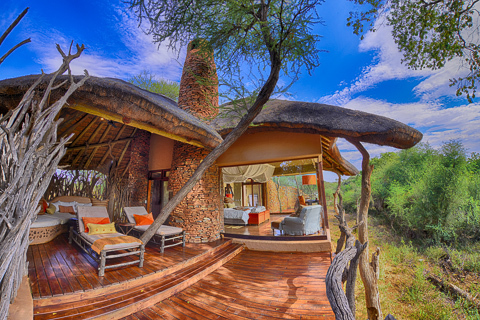 There are 8 luxurious thatched suites spread out from the main lodge, suite 1 is just next to the entrance of the main lodge while the other suites are on the opposite side of the boma. Shaded graveled pathways will bring you to your private suite. 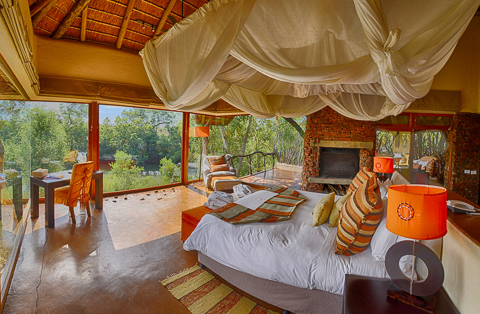 Large teak doors lead into the suites which are designed with natural rock and dried tree trunks as the feature of each suite, floor to ceiling glass windows in the bedrooms blends effortlessly with the riverine forest and offers exquisite views of the Marico River. 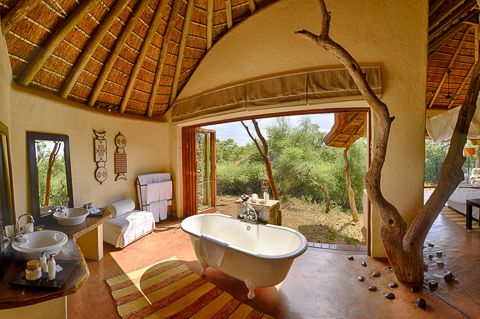 The large en-suite bathrooms have wooden folding doors that open, allowing nature in while you enjoy a luxurious bath in a freestanding bathtub. There is also a large indoor shower and a true to nature outdoor shower. 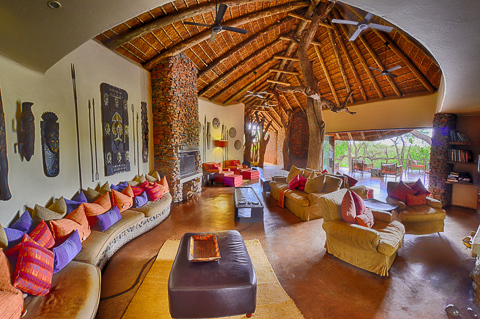 The open lounge with loungers and seating area has a private viewing deck that is the perfect place to relax while enjoying the sights and sounds of the African bush. Each suite has a fireplace, overhead fan, air-conditioner and heating system, a telephone, tea and coffee facility, mini safe, a bar fridge, bathrobes, hairdryers, insect repellent, body and sun lotion. The suites are well-spaced giving each guest the privacy they need. We had suite 8 which is on the far left of the main lodge building with a great view of the river. 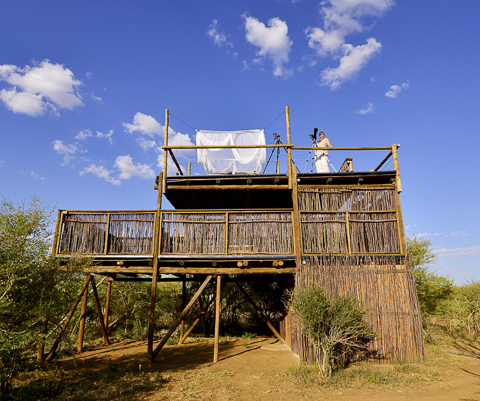 A few kilometers away from the main lodge on an open plain lies Makanyane’s hidden treasure; a private sleep-out hide where you are able to sleep under the African sky! The hide has three levels; as you enter through the door of the bottom level you go into the bathroom; it has a chemical toilet, a bowl of water with towels and soap for washing up. 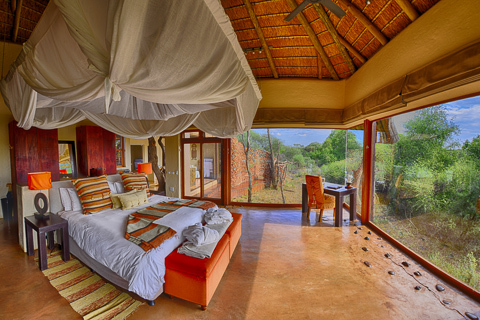 Then the second level is the covered lounge/seating area with a tea / coffee station plus an open seating area and the top or 3rd level is the bedroom which is open to the great African sky. Twin mattresses lay on top of a raised platform with mosquito net. 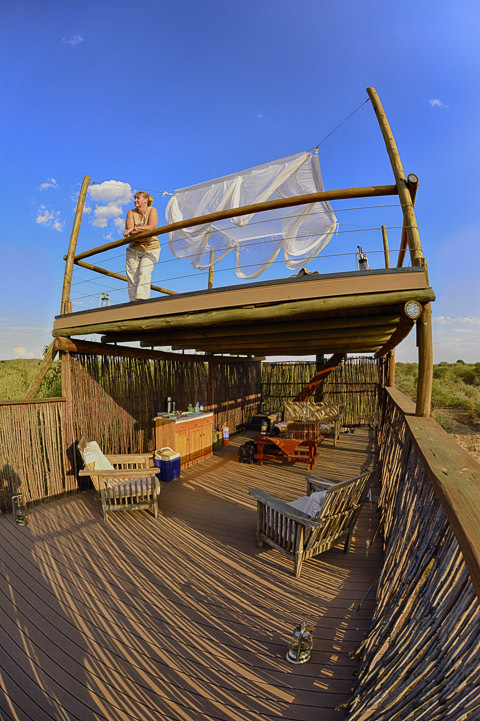 This level gives you a view over the Madikwe plains and a dry waterhole which sometimes fills up in the summer months after good rain. 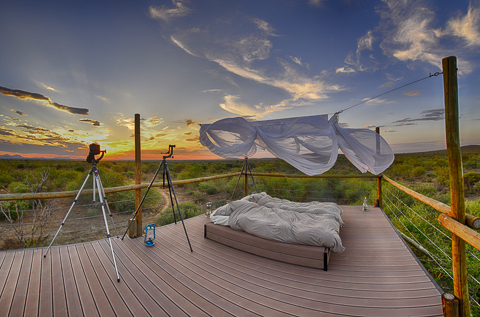 We had a wonderful night under the stars as the night sounds lulled us to sleep. Two guided game drives per day, one early morning and one late afternoon giving you a chance to experience what the African bush has to offer. Alternatively you can relax round the infinity pool with a good book. 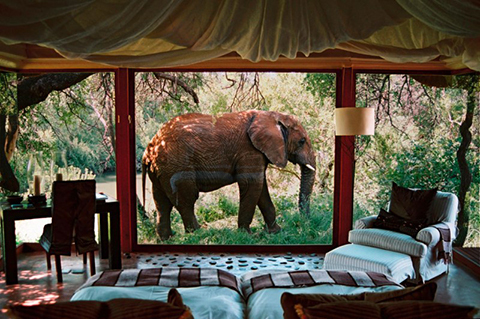 The river runs right next to the deck so you may get to see one of the big 5 coming down for a drink like we did. Try one of the many wellness treatments at the health center or have a work out in the gym; you can also have a treatment on the deck of your suite. Elephant - two came to the lodge one for a drink in front of the lodge and the other walked between suites 6 and 7 and came round to the back of the lodge. 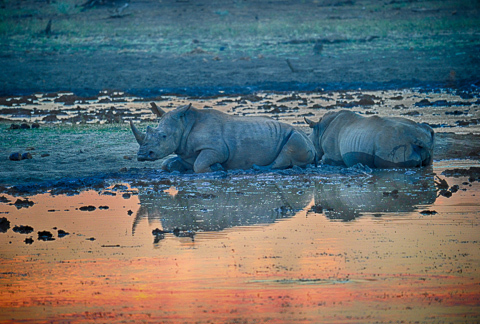 We had 5 rhino sightings which were great, plus giraffe and the normal plains game; like zebra, gnus, impala and kudus. 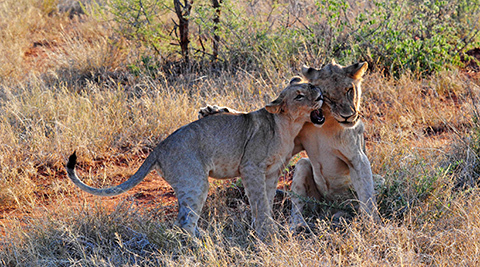 Lions - we heard them roaring in front of the lodge one night so the next day we went to find them - two young cubs playing in the long grass who then walked to a clump of trees where the adults and another cub lay. That night the lions ended up under the sleep-out hide so the couple staying there had a bit of delay getting out the next morning! On our second visit to Makanyane Safari Lodge we had Dylan Marriner as our field guide and you can read about our fantastic experience here. 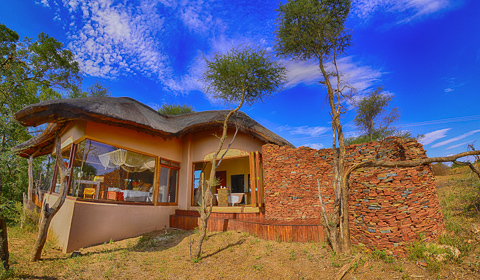 For more information or to make your booking please visit the Makanyane Safari Lodge website.